The 21 students arriving in St. Louis from China this fall are one example of partnership between Webster University and Beijing Language and Culture University (BLCU), but this week a different kind of student will head in the other direction. St. Louis native Madeleine Biggs has been studying Chinese language at Webster University since before she even graduated high school. Now the current Webster University student is headed to BLCU to study abroad this fall. Biggs began studying Chinese at Webster while still a junior at Webster Groves High School. She has already received high scores on three levels of the five basic tests for Chinese language proficiency and surpassed the curriculum offered at Webster. She is currently working with the International Languages and Cultures department, in Webster's College of Arts & Sciences, about the possibility of developing a brand new certificate in Chinese Language. In Beijing this fall, Biggs will take courses towards her International Studies degree with an emphasis in International Business. In addition to the valuable experience that she will gain both inside and outside the classroom, Biggs will also be working as an intern under the local staff at BLCU. This is quite a prestigious honor to be chosen for such a position. As a candidate she had to give an impromptu speech in Chinese! According to Kim McGrath, director of Webster International Network of Schools (WINS), Biggs is one of a kind. “She came to the Office of Study Abroad well in advance of her participation in the program, with an obvious grasp of Chinese language and culture, to plan for the experience and ensure that it met her personal and academic goals," McGrath said. "It is uncommon to see such a strong interest in China, not to mention such highly developed language and culture skills, in a typical U.S. undergraduate student." 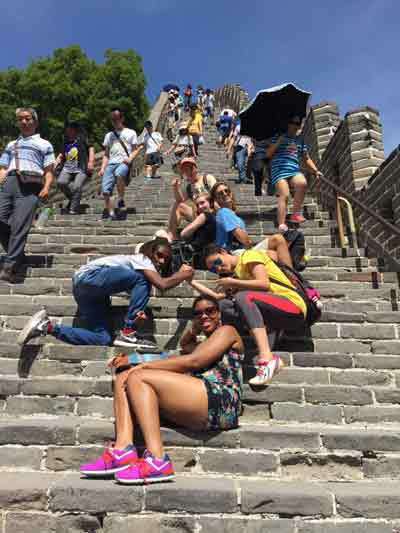 Biggs’s study abroad experience is far from her first trip to China. While in high school, she first visited with a group of students as a volunteer with Beijing No. 4 High School to teach English culture and language. It was quite an immersive cultural experience as she was the only foreigner in town. A year later, she returned to visit some friends she had made on that volunteer excursion. Biggs has also travelled to China with Webster’s Summer Bridge Camp two summers in a row. In 2014 she went as a student. Upon her return she began working for Webster's Confucius Institute, which has twice been recognized as Confucius Institute of the Year. This past summer she accompanied the CI on the summer program as a teacher. In explaining one of the most important things about Chinese culture, Biggs says that "negotiation not only takes place in a conference room but in all aspects of the Chinese society. From bargaining the price of a dress to presenting someone with a gift, there is a little bit of negotiation that goes along with them so that there is a mutual gain. Unlike western cultures that encourage individualism and personal gain, there is a large focus on collectivism and a gain for everyone." Her message to other students that might be unsure about studying in China, or studying Chinese, focuses on its accessibility. “Contrary to popular belief, Chinese is not difficult to learn. Since it is so different from romantic languages, an English speaker can learn it from a clean slate," she said. "The only hard part of studying in China is enduring the 14-hour flight there. Once you arrive, everyone you meet will be ecstatic that you are learning their language and will go out of their way to aid you in whatever way they possibly can. Even if you are not interested in going to China but are thinking of studying abroad, make sure that you take all the chances that you get before they pass you by." Biggs is an example of the kind of outstanding student and opportunity that is possible through Webster and its international partnerships. A semifinalist for the Presidential Scholarship, she declined an opportunity to study at Cornell to instead become a Gorlok. Her future goal is to receive her master’s degree from BLCU and work for an international company in the U.S. that also has offices in China.